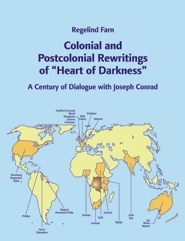 Colonial and Postcolonial Rewritings of "Heart of Darkness"
Joseph Conrad's novella "Heart of Darkness" (1899) is taught and read all over the world. Everywhere, novelists and travel writers respond to it in their own creative work. I discuss 30 responses, or rewritings, from Africa, India, the Caribbean, Australia, Europe and the US. Their perspectives include those of groups who identify with Conrad's Europeans and groups who feel close to his Africans, and increasingly those of groups who situate themselves between these two extremes in various ways. I identify world-wide developments as well as themes, strategies and paradigm shifts that correlate with different geopolitical situations. Rewriters address the contribution Conrad has made to the identities of his very different readers, and the patterns he has suggested for encounters. In ever more intense dialogues, people from all backgrounds work through images of themselves and of each other. However, like Conrad's narrator, they also become aware of limits of language and communication. Rewriters act as rereaders of the many layers of meaning in "Heart of Darkness", and thus imply that the reader's experience is as important as the author's. This approach is increasingly developing into a use of discourse-analytical methods in non-theoretical texts. Rewritings can bring "Heart of Darkness" close to the readers' lives. Rewriters champion processes of highly personal learning and unlearning as well as political and social approaches, and can thus help readers rework their own cultural backgrounds. Accordingly, I both use close-reading methods and take into account political and didactic intentions. In conclusion, I recommend reading "Heart of Darkness" together with one or more of its rewritings, and outline some ideas for teaching such combinations. After comprehensive introductions to "Heart of Darkness" and to the theory of rewritings, I discuss works by the following authors in a convenient handbook format: Ford Madox Ford (Hueffer), Leonard Woolf, W. Somerset Maugham, Andre Gide, Louis-Ferdinand Celine, Graham Greene, Charlotte Jay, Patrick White, Chinua Achebe, Wilson Harris, Ngugi wa Thiong'o, Tayeb Salih, Arun Joshi, J.M. Coetzee, V.S. Naipaul, Robert Silverberg, Caryl Phillips, David Dabydeen, Marlene NourbeSe Philip, David Malouf, Mineke Schipper, Abdulrazak Gurnah, Urs Widmer, Redmond O'Hanlon, Arundhati Roy, Barbara Kingsolver and Jeffrey Tayler. Regelind Farn holds degrees in Theoretical Computing and in Cultural Studies. As a highly specialized translator, she permanently negotiates between cultures and languages, and between approaches from the two faculties. Her interest in hybridity and mediation shapes this study.